This photograph is a first for this website - a tintype. What's a tintype? I hear you asking. 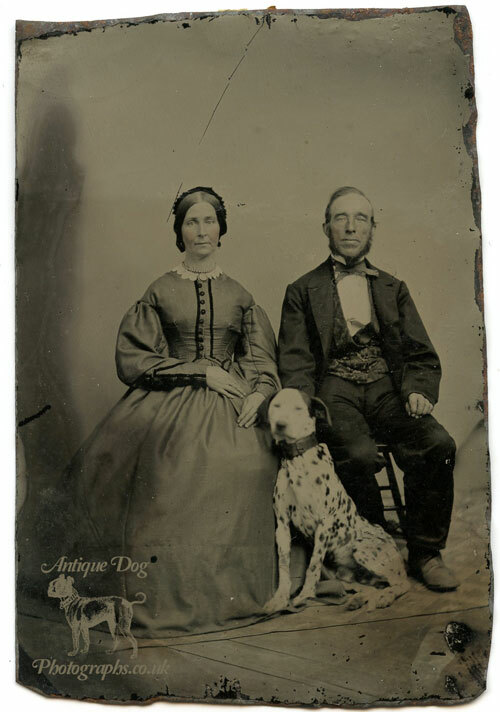 A tintype (which can also be know as a melainotype or ferrotype) is a photograph made by creating a direct positive on a sheet of iron metal. A very underexposed negative image is produced on a thin iron plate, lacquered or otherwise darkened, and coated with a collodion photographic emulsion. Since in a negative image the darker portions of the subject appear lighter, or in this case more transparent, the dark background gives the resulting image the appearance of a positive. So despite the name there is no tin in a tintype! The process is quite hard to visualize but this great video shows you how a tintype is made. We can date this photograph pretty accurately because of the stamp on the reverse. At the start of the American Civil War the Revenue Act of 1862 was passed by the Union goverment. This was a tax on "luxury goods" such as playing cards and telegrams. By 1864 with money for the war running out Congress passed an act which also taxed photographs. 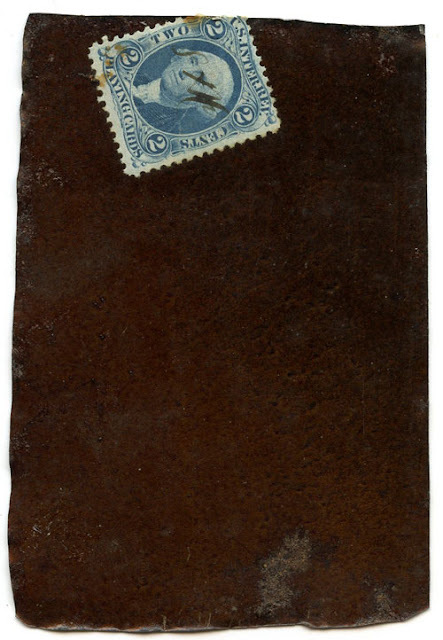 Photographers were required to collect the tax, apply the stamp showing that the tax had been paid, and then cancel the stamp by initialing and dating it. The 2 cent stamp on this tintype tells us that the sitters originally paid 25 cents for this photograph. By 1865 the tax was repealed on photographs, so this tintype was made between 1864 and 1865. 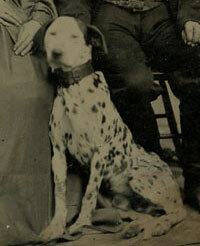 I believe this could be one of the earliest photographic depictions of a Dalmatian that exists. The dog bears a striking similarity of Dalmatian's of the period. The Ohio Historicial Society Blog - What do you know about Tintypes? Hi. 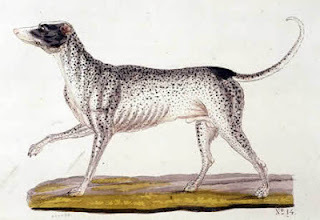 What a great blog, I just love those old dog photos. Have a nice day! Lauren, what a great concept for a photo blog! Your commentary is informative--great way for readers to learn a bit more about history through photography. I found a mention of your blog today at GeneaBloggers and thought I'd stop by and check it out. Best wishes as you continue blogging...and welcome to GeneaBloggers! Welcome to Geneabloggers Lauren! I'm really enjoying your photographs. Welcome to GeneaBloggers! I love the pics! This is a great idea for a blog - what wonderful photos! I'm glad Genealbloggers told me about it.